How long have you spent tossing and turning all night long? Sleep is probably one of the most important aspects for a long and fulfilling life. Without sleep, you can’t be productive or even useful. Too many people across the world sacrifice sleep for no reason at all. A good bed can help you overcome sleepless nights. Those who have trouble falling asleep or staying asleep can often solve the problem by changing mattresses. Here’s how a good bed can help you overcome your sleepless nights. 1. Comfort. When was the last time you replaced your mattress? Have you been sleeping on the same mattress for more than 8 years? 10 years? 15 years? 20 years? If so, it is definitely time to replace your mattress. It is important to choose a mattress that is comfortable. Common sense tells us that a comfortable mattress equals a good night’s sleep and that an uncomfortable mattress equals a sleepless night. Choose a mattress that provides comfort to your individual body. 2. Support. All too often, people sleep on a mattress that does provide the correct quality of support. It is so important that your entire body is properly supported while you sleep. Much of the fatigue people feel when they wake up in the morning is attributed to incorrect support. Remember that everyone needs different support. Choose a mattress that will also keep your spine properly aligned. This is another important element for a good night’s sleep. 3. The right mattress. Do you use an innerspring mattress? Do you think that that is the only type of mattress out there? Well, think again. There are many kinds of mattresses. If you have been sleeping on an innerspring mattress your entire life and aren’t getting the rest you need, it is probably time to invest in another kind of mattress. You can choose from air mattresses, water beds, memory foam mattresses and latex foam mattresses. Each of these mattresses come with its own list of pros and cons. Customers seem to be more satisfied with the latex foam mattresses, but these are pricey. Carefully consider a new kind of mattress to overcome sleepless nights. A good bed may be just what you need to overcome sleepless nights. Try these suggestions to make sure you choose the right bed and the right mattress. Kiss those sleepless nights goodbye. Here is the Rocky Mountain Mattress question of the day – To Flip or Not To Flip? These tips are for your everyday mattresses. It is so important that you take care of your mattress. You need to flip and rotate your mattress at least every six months. Flipping your mattress means that you flip the mattress so that the bottom is on top and the top is on bottom. This will keep the wear of your mattress from being on one side. You also need to make sure to rotate your mattress. This means you rotate the bed in a clockwise or counter-clockwise pattern, moving the foot of the bed to the head and the head of the bed to the foot. If your mattress can’t be flipped, be sure to rotate it. For instance, it really wouldn’t make much sense to flip a pillow top mattress. If you do, you’d be sleeping on the pillow top surface some of the time and a different surface the rest of the time. Make sure that you rotate your mattress, especially if you can’t flip it. It takes a certain amount of handling to properly care for a mattress. You can’t buy a mattress, not take care of it and expect it to last throughout your lifetime. First of all, remember that you will go through several mattresses throughout your life. Mattresses do wear out over time and can’t provide as good of support as it once did. If you want to get the most use out of your mattress, here are a few things to keep in mind. 1. Flip and/or rotate it. Every six months, you should flip and/or rotate your mattress. This will prevent one section of your mattress from wearing down faster than the other parts. Depending on how your mattress is constructed you may need to flip it one or both of two different ways. 1) Six months after you get your mattress, flip it so that the top is now on the bottom and the bottom is now on the top. 2) Six months after that, rotate it so that the foot of the mattress is at the end and that the head of the mattress is at the foot. If you have a mattress (such as a pillowtop) that cannot be flipped, make sure you at least rotate it religiously. 2. Cover it. Don’t let the bed bugs bite…or dust mites, or other allergens. Cover your mattress. Mattress covers are cheap and can lengthen the life of your mattress. Many mattress covers are machine washable so you can really make sure that your mattress is well protected. 3. Remove the dust. Even if you are using the best sheet you possibly can, dust is going to get on top of your mattress. Obviously, you need to remove the dust. But, it isn’t just dust you are going to be removing. Dander and dust mites can also build up. Your vacuum is a great thing to use to get rid of dust, dander and dust mites. Simply use the upholstery attachment to vacuum away all of these things. 4. When in doubt, shampoo. Mattress that aren’t protected with a mattress cover can really get disgustingly dirty. If this is the case with your mattress, use an upholstery shampoo. Be sure to follow the instructions exactly. The shampoo can get rid of dirt and soil from the surface of your mattress. Make sure to allow the surface to dry completely. Also, make sure you put a mattress cover on after cleaning it so that you won’t have to go through that again. If you want something to last, you need to take care of it. Taking care of your mattress is extremely easy to do and isn’t very time consuming. Extend the life of your mattress by 3-5 years by taking care of it. I am very thankful for the amazing customers we have here at Rocky Mountain Mattress. I often get asked the question – How often should I replace my mattress? To answer that question so people do not think I am just trying to sell more mattresses, I did some research that I want to share with all who read this blog, and are wondering if its time to replace their mattress as well. The Better Sleep Council says every 5-7 years, and there is good reason for that so just read on. Many people think that when they buy a mattress, it will last them 20 years or more. Although your mattress may appear to be in good shape, you need to take a careful assessment of its performance. Is your mattress giving you the support that it once did? Is it still comfortable to sleep on? Are you waking up feeling refreshed? Do you wake up with any sort of back or neck pain? 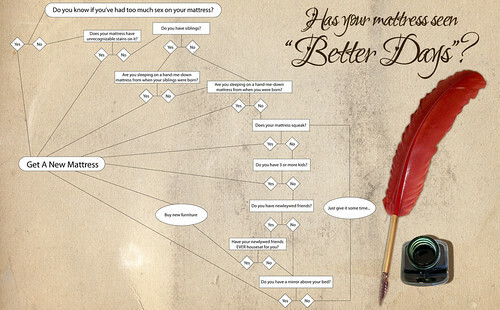 If you answered yes to any of these questions, it may be time to replace your mattress. The Better Sleep Council recommends that you replace your mattress every five to seven years. However, there are many factors to consider. This recommendation may need to be altered depending on the quality and life of your mattress. A mattress used for a guest room won’t need to be changed as often as a mattress that is used every night. When you bought your mattress, was it top-quality or was it a cheap-o that you got on clearance. Inexpensive mattresses probably should be changed more frequently due to a lesser quality. Not only will your mattress change over time, but your body will change too. Your body may need more support now than when you were 16. Studies have shown that a person needs more comfort and support while they sleep as they get older. Weight gain or loss may also affect the performance of your mattress. It may seem inconvenient to change your mattress every few years. It is well worth it though. Your sleeping patterns and needs will change over time. It’s important that your mattress is providing you the best nights sleep possible. Examine your needs and your mattress quality every five to seven years. You will be more productive and happy if you are getting the sleep you need on a new mattress every several years. Unfortunately, a urine stained mattress is not an uncommon sight. Young children and pets often have accidents in the most inconvenient places imaginable, and those accidents can leave behind unsightly stains and unpleasant smells. Most parents and pet owners have at one time or another been faced with the unpleasant task of trying to remove urine from a mattress. It’s important to keep in mind that actually cleaning the urine stain is important. Since bacteria is found in urine, leaving a stain untreated for an extended period can result in the growth of fungus and mold in the mattress. In some cases, this can completely ruin a mattress. While some products sold commercially are designed for removing urine smells from most furniture, there are several household tips and products that can work just as effectively as those expensive sprays and products. Many parents and pet owners report that vinegar works wonders in removing the smell of urine from a mattress. Pour a moderate amount of vinegar on the soiled area, and absorb excess liquid with a large towel or wet vacuum. Keep in mind that this method is designed to remove the smell and kill bacteria, so spot treating the actual stain will be necessary to lift or fade the urine stain. Rubbing alcohol and other grain alcohols often have the same effect as vinegar. Like vinegar, though, alcohol may not remove the stain, so other methods for stain fighting should be used. Liquid Laundry Detergent: For new urine stains, many mattress owners have found that simply using detergent or shampoo and a small amount of water will remove the stain. This is often less effective for stains that have set for some period of time, and may not be completely effective in removing the smells. Whenever possible, consider using a hot steam cleaner on mattresses with urine stains. Used with a cleansing agent, steam cleaning is usually quite effective at removing the physical stain, eliminating the smell of urine, and killing bacteria that may otherwise grow and spread. Caring for your mattress is just as important as caring for your car or anything else that you use on a daily basis. When a person spends most of their life in their bed, it is important to do everything you can to keep your mattress is good condition so you can keep it as long as possible. Although these cleaning tips are readily available to you on and offline, the fact is many people do not take the time to care for their mattress properly. This lack of care causes people to purchase a new mattress more frequently than necessary. Below are some necessary steps to take every 6 months at least. These are a few simple things you can do twice a year to ensure your mattress has a long and vibrant life. By taking the time to vacuum, wash and care for your mattress you are literally prolonging its life by several years. Once a mattress is damp or soiled and not cleaned properly it will need immediate replacing and this is something no one wants to do on a regular basis. When you have children or someone who has a health condition that may cause them to wet the bed on occasion it becomes that much more important to follow these cleaning tips in order to keep your mattress in great shape. Don’t think that every 10 years or less you need to buy a new mattress when it can last you 15 years or more. Enjoy the mattress you love for as long as possible by taking an hour out of your day only twice a year to maintain and care for it properly.